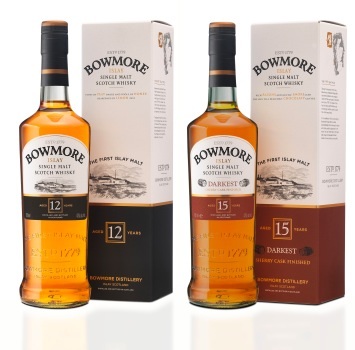 Bowmore has revamped its range of Islay single malt whiskies and introduced three new expressions exclusive to global travel retail (GTR). On top of launching a new gift box and a refreshed bottle design across its entire domestic and GTR offering, the brand has launched its new whiskies “100 Degrees Proof”, “Springtide” and the limited edition Bowmore 1983 into GTR. Bowmore, the first Islay Single Maltwhisky, today proudly unveils brand new packaging for its entire domestic and global travel retail / duty free range – a premium gift box and refreshed bottle design which will be released in February 2012. A statement added: “The changes are also in response to consumer demand for a greater level of education on the taste experience and the history of the whisky and as such the new packaging communicates the brand’s unique status as the first Islay Single Malt and its 200 years worth of experience and heritage. “The new look reinforces Bowmore’s ‘gift-ability’ as it features a greater level of foiling and gloss embossing thus creating shelf stand-out. The updated distillery illustration has a warmer and more emotive look and feel that strongly conveys the whisky’s roots, that is the magical island of Islay, giving category differentiation and shelf appeal. The company is also keen to emphasise how the new packaging has improved the brand’s environmental considerations, with the bottle being made of lighter weight glass and the new cartons being 100% recyclable. Kirsteen Beeston, head of brands at Morrison Bowmore Distillers, said: “We are excited to be taking Bowmore into a new era with this new gift box and bottle design. The three new additions to Morrison Bowmore’s GTR range join existing expressions Surf, Enigma 12 Years Old, Mariner 15 Years Old and 17 Years Old. The new additions to the collection will be available from March 2012.